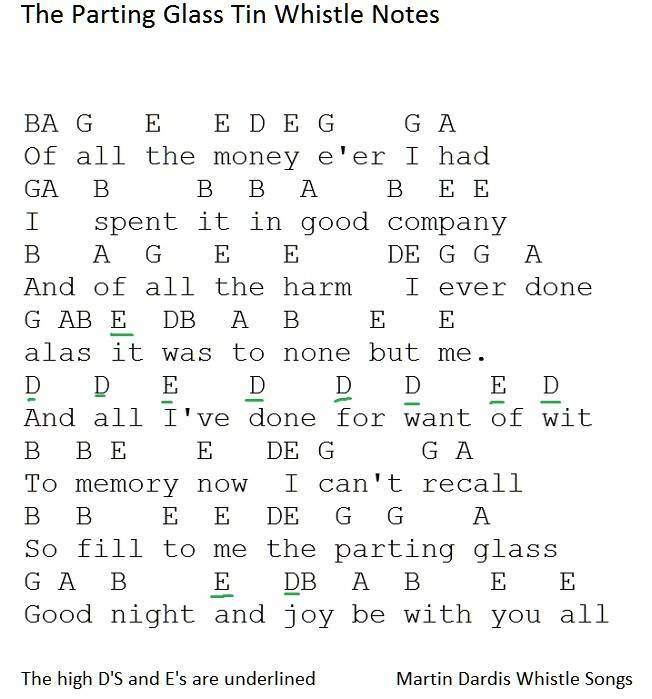 The Parting Glass sheet music and tin whistle notes, recorded by The Clancy Brothers, also by The Pogues. A Traditional Irish tune. The banjo / mandolin tab is now included. The version I have here has been influenced from listening to the Pogues version. When Shane MacGowan is singing he puts a couple of syllables into one and two letter words and I done the same as I think it sounds much better. Take the start of the tune for example, the first word is ''Of'' , well I placed 2 notes just for that word and in the word ''Alas'' I used 3 notes. Here's a youtube video of myself playing the Parting Glass, it's not too hard to play.